Every patient placed on the treatment table trusts that radiation delivery is safe. Delivering on that trust takes discipline and a deep-rooted culture of safety. Varian customers are using the capabilities afforded by Varian treatment delivery systems to help implement rigorous safety practices in their workflows. In this article, Centerline looks at some of the safety practices at several treatment centers using Varian technology to treat cancer patients. The Department of Radiation Medicine at the UC San Diego (UCSD) Health System has long been a leader in patient safety. Strong believers that safety is a never-ending process, the department developed a web-based incident reporting system to capture incidents and near misses in real time so that they can be documented, communicated, analyzed, and learned from. A similar system tracks linear accelerator interlock events and other service issues, and alerts all clinical physicists by email whenever such an incident is logged. Through a special arrangement with Varian, event notifications are simultaneously sent electronically from the reporting system to Varian’s technical help desk for immediate troubleshooting. “Several other centers around the country have incident learning systems as well. We’re all doing similar things, trying to capture incidents as they arise in the clinic,” says Todd Pawlicki, PhD, FAAPM, professor and vice-chair of medical physics at the UCSD School of Medicine. There is also a parallel effort in the United States, supported by the American Society for Therapeutic Radiology and Oncology (ASTRO) and the American Association of Physicists in Medicine (AAPM) that created a national incident learning system into which everyone around the country can feed data. The system, called Radiation Oncology-Incident Learning System (RO-ILS), went live in June 2014. It’s free, confidential, and non-punitive, in keeping with the protections mandated by the Patient Safety and Quality Improvement Act of 2005. “What may be unique about the UCSD approach is that we have two reporting systems—one specifically for the linear accelerators and another voluntary one for other types of incidents with the potential to reach patients,” says Pawlicki. 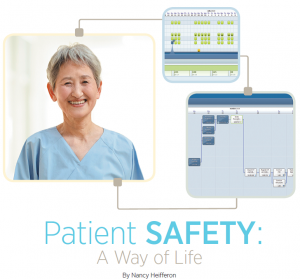 What did UCSD learn about the risks to patient safety? In 2014, the department published a four-year study of the reporting system.1 During the study period, there were 60,168 external beam radiotherapy fractions and 955 brachytherapy procedures delivered. Of the 298 entries in the reporting system, 108 were reported errors. The largest portion of errors in the study, 36 percent, occurred during treatment planning; however, they were most often caught and corrected before delivery. Incidents of inaccurate treatment occurred in 0.11 percent of the treatments delivered. None deviated from prescription by 5 percent or more, and most were caused by improper patient setup at the linear accelerator. An important conclusion from the study: incident learning systems are a practical means of improving safety and quality in patient care. “Clinic-based incident learning systems may seem complicated and daunting to implement, but they don’t have to be,” says Sasa Mutic, PhD, FAAPM, one of the directors, along with Todd Pawlicki, of the TreatSafely Foundation. The TreatSafely Foundation is a nonprofit organization devoted to the development of teaching and mentoring programs that improve quality and safety in radiation medicine. It was founded by Pawlicki, Mutic, and two colleagues: Peter Dunscombe, PhD, professor emeritus at the Tom Baker Cancer Centre in Calgary, Canada; and Derek Brown, PhD, associate clinical professor in the Department of Radiation Medicine and Applied Sciences at UCSD. They recognized that quality and safety tools, such as root cause analysis, prospective hazard analysis, and process control tools, which are commonly used in other fields, could be just as useful in radiotherapy. TreatSafely presents workshops around the world on practical methods for improving safety, including a customized course covering the safe use of Varian products in the clinical setting, offered at the Varian training center in Las Vegas, Nevada. In his day job, Mutic is director of medical physics and a professor of radiation oncology at the Siteman Cancer Center at Washington University School of Medicine in St. Louis, Missouri. “In 2010, when serious radiation incidents were in the news, our hospital board asked if we knew that all our patients were treated correctly every day, and we had to admit that we lacked that independent verification. While we were performing the same weekly and other checks as the rest of the field, we realized that these were not sufficient and that increased checking frequency was needed,” he recalls. That’s when Mutic’s department implemented an automated process of daily review of treatments, using the DynaLog™ and trajectory log files generated by Varian linear accelerators. Mutic’s department leverages Varian technology to improve safety processes. 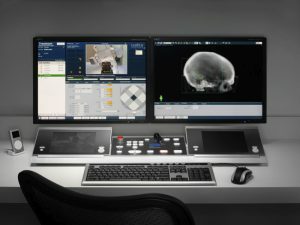 Other Varian users are also using the capabilities of Varian software to embed safety processes into the daily workflow. It is increasingly common for healthcare providers to use biometric data for patient identification at patient registration to reduce fraud. The radiation oncology departments at UCSD and Montefiore Health System go further and use biometric data to verify patient identity at the treatment vault. UCSD employs iris scanning using a digital camera to take an image. A web application confirms the patient’s identity, queries the ARIA® oncology information system to match the patient to the scheduled treatment machine, and then verifies that the correct treatment is loaded and “in progress” at the treatment console. “This process takes less than 30 seconds,” says UCSD’s Todd Pawlicki. The time-out is then recorded and stored. The Department of Radiation Oncology at Montefiore uses the ARIA oncology information system to create treatmentplanning care paths with built-in safety points. “We have time-outs that stop the workflow until required tasks are completed at critical points, such as contour review, plan approval, and physics checks. Even with the palm scan, treatment can’t begin until a time-out checklist has been completed,” says Tomé. ARIA has several features that can be applied to enhance patient safety, including care paths, approvals, questionnaires, checklists, and alerts. “The most popular one is the ability to build care paths, ” says Jenny Davison, an ARIA instructor at the Las Vegas, Nevada training center. “I see many customers, like Montefiore, who are building treatment-planning care paths, which are essentially process maps of all the steps needed to get a plan ready for treatment. Care paths make sure that nothing is missed.” Planning can’t continue and treatment can’t be delivered until all the steps in the care path are completed in order and on time. Time-outs, a safety practice adapted from surgery and recommended by ASTRO guidelines, can be built into ARIA using questionnaires or checklists. Davison’s favorite is the questionnaire. “Customers tell me that auditors want to see documentation that the time-out was performed before the patient was treated. When you complete the time-out in the form of a questionnaire and click ‘approved,’ it receives a date and time stamp that you can show an auditor.” She also likes questionnaires because they are so customizable. They can be formatted in different ways and incorporate drop-down menus, yes-no buttons, and check boxes. Time-outs can also be created as checklists that are attached to an appointment or to a task. “The advantage of using a checklist for a safety time-out is that the appointment can’t be completed and charges captured until all the checklist items have been completed,” says Davison. Custom alerts can be created in ARIA to enhance safety. Alerts are the equivalents of notes that might be put in a patient’s chart, such as “patient is a fall risk” or “patient needs to see the doctor following treatment.” They pop up on the workstation before treatment begins. Typically, alerts aren’t used for time-outs because they aren’t as in depth or interactive as questionnaires or checklists. However, they are a useful safety tool in the clinic. In radiation oncology, safety is a way of life. Thanks to continuous development in technology, processes, learning systems, and education in the field of radiation oncology, radiation treatment is safer than ever. “Radiation safety is of the utmost importance to us at Varian, and also to the clinicians who use our technology to help thousands of cancer patients every year,” says Stan Mansfield, director of system safety at Varian. Rahn DA et al. A Real-Time Safety and Quality Reporting System: Assessment of Clinical Data and Staff Participation. Int J Radiation Oncol Biol Phys, 2014;90:1202-1208. 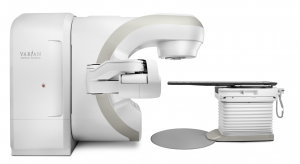 Varian Medical Systems’ linear accelerators are intended to provide stereotactic radiosurgery and precision radiotherapy for lesions, tumors, and conditions anywhere in the body where radiation treatment is indicated.